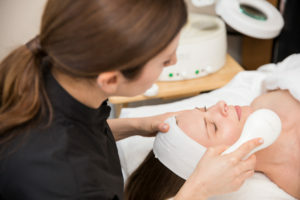 Why Is It Important to Get a Facial? I am a licensed esthetician. Or if it’s easier to pronounce, a facialist (it’s certainly easier to spell). So obviously, I would think it’s important to get a facial. And, of course it is!!! But, do you know why it is important to get facials? I know you can wash your own face… but do you wash your own face? Well, caring for your skin is the same. You should do maintenance each day and then see me for that deep cleaning and recommendations to address any concerns you may be having. I want to share with you the 3 most important reasons to get a facial. Your skin is the largest organ of your body. It’s main job is to keep all of your inner organs from falling out onto the floor, as well as keeping bad bacterias out and good bacterias in. Your skin breaths and changes constantly, especially as women. Our hormones adjust monthly as well as through the different phases of our life. As these changes occur, our skin will recalibrate with it. In addition, it fights off invisible invaders or even combats the effects of stress when it has snuck up on us or we are dealing with life changes. Facials remove all the dirt and oil that have been left behind from your cleanser, it will also remove layers of dead skin cells to allow your skin to breath and glow. A variety of devices or even the power of touch can stimulate blood flow and oxygen movement while promoting collagen and elastin production. #2 Have a Professional analyze your specific skin concerns and condition. We are SO self-critical! If I could make one change in this world, it would be to prevent women from ever saying how bad their skin is! (Ok, if I could really only do 1 thing… it would definitely be more altruistic than that… maybe have humanity be more considerate to each other??? Ok, soapbox dismount). I could go on and on, but here’s the truth… NO ONE LOOKS AT YOUR SKIN AS CLOSELY AS YOU DO! (With the exception of me of course.) Try looking at yourself in the mirror at the same distance that another human being would stand in front of you. Now tell me what you see… You can’t see all those “imperfections” and no one else sees them either and they certainly aren’t judging you. So cut yourself some slack, get a facial and we will focus on making your skin glow because you can’t change your pore size or remove your freckles so stop trying. As a professional, I will look at your skin and give you a realistic interpretation of your skin. I can tell you the difference between dehydrated vs. dry, having breakouts vs. acne, whiteheads vs. blackheads and I will arm you with the best ingredients to treat the current condition of your skin. Most importantly, I will treat your skin with the respect that it deserves. #3 Give yourself permission to relax and get some personal downtime. We all have so many demands on our lives. You deserve to feel pretty and to laugh and have those weird, crazy dreams one has when falling asleep for a minute or 2 during a facial. There are many studies that talk about how important sleep is for your health. Sleep improves your mood, your diet, your memory and I can guarantee if you want younger, healthier, glowing skin… you will see a vast improvement if you sleep. Sometimes “sleep” comes in the form of a relaxing facial. These days it’s often called self-care but it’s more than that… it’s essential to your health. If you don’t give to yourself how can you possibly give to all those other people that are demanding your attention? Getting facials is an important part of a well-balanced life. Professionally, I recommend getting a facial every 4 weeks, it keeps your skin healthy, your products work better, therefore saving money in the long run, and maintains the youthful glow we are all trying to achieve. For some, 4 weeks may not be realistic, so consider getting a facial quarterly or even seasonally. We all have busy lives, so I offer my clients the option to receive a no pressure reminder around the time they may want to schedule their next appointment. Call or text 424-256-5122 to book a facial with me at my private treatment room or book online at any time! I also offer 1-on-1 virtual skincare coaching as well as Skincare workshops for you and your friends. Get in touch for more information by visiting the contact page or filling out the form below.